Shortage of tilers across the UK. In the UK there is a massive shortage of skilled tradesman due to the amount of new build property developments. Many people are currently looking to remodel their own properties but with an average wait time of around 4-6 weeks to find a wall and floor tiler they will be paying a premium due to supply and demand. Now could be the right time to cash in on your own DIY skills and maybe think about turning your hobby into a new lucrative business. Tiling is a great way to make a living especially when your self employed, high earnings, freedom to work when you want and nobody to answer to, these are just some of the reasons to why so many people are retraining and finding a good quality tiling course that can fast track them with the correct knowledge and skills to do the job. 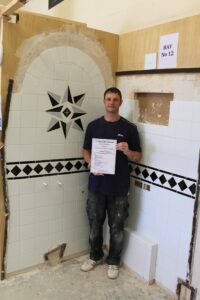 There are a few tiling courses in the UK to choose from but not all tiling courses are the same, some offer basic DIY skill levels of learning whilst others can provide a full on professional fast track course teaching you all the tricks of the trade which has taken many years to acquire, these key skills can be passed on within a matter of weeks with no prior tiling experience necessary. Tilers complete a varied amount of work from kitchen splash backs and kitchen floors, bathroom walls and floors to swimming pools if your lucky enough to have one. Tiling is also very satisfying as once the project is finished the room is usually transformed beyond belief much to the appreciation of the customer. With tiling rates of pay reaching Â£20-30 per meter, some tillers are earning well over Â£1000 per week and enjoying a healthy lifestyle. At UK Pro Tiling Training we understand what it takes to be good and make your way in the tiling world, which is why we offer comprehensive tiling courses designed to get you working for yourself fast. All of our intensive courses cover full business start up advice so you will not only learn all the practical aspect of professional tiling you will learn how to market and sell your tiling services to your potential customers. 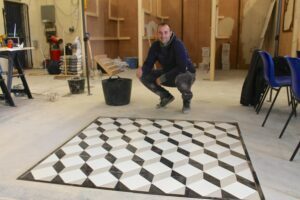 Our courses have run for over 13 years and many people who have attended the course are now running their own successful tiling businesses, many people come with no prior experience which is better because you are not coming with any bad habits so let us show you the corrects methods and all you have to do is replicate them, we have a huge proven track record with hundreds of 5 star positive reviews. Course run between 1 and 3 weeks and start from as little as Â£375, a small investment which could change your life.